I love MXR. 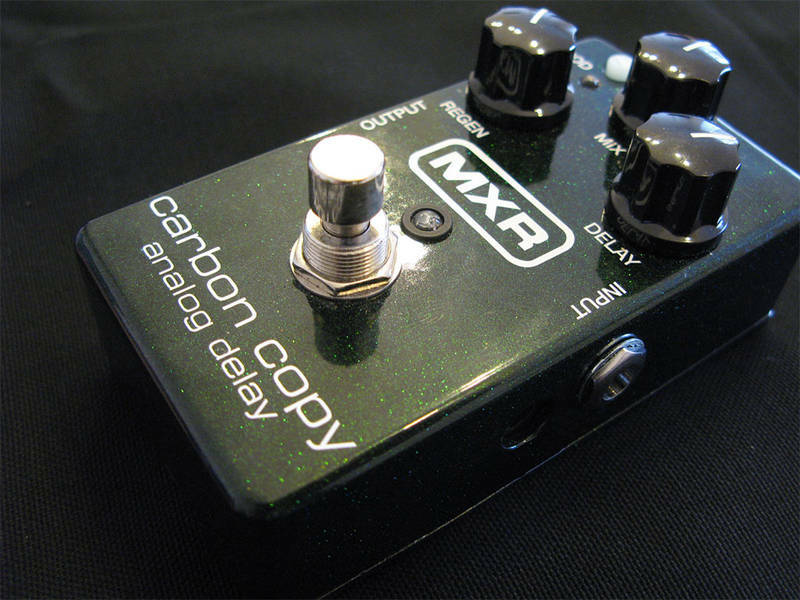 I’ve never come across an MXR pedal I didn’t like, and their Carbon Copy analog delay doesn’t seem to break that trend. The Carbon Copy is a bucket brigade, analog delay that features built in modulation. I admit I’ve never played on, so everything I’m going to write is based on other reviews and YouTube clips. The pedal costs $150 new and is available just about everywhere. Like I said, I’ve yet to find a bad review. Near as I can tell the CC does everything you’d want an analog delay to do with none of the things you don’t want. The repeats are warm in a way that a Bucket Brigade style delay should be, but with none of the over the top warble found in some analog delays (the EHX Deluxe Memory Boy being a notable example). It has that great warm analog sound. It has built in modulation like you find on the Deluxe Memory Man that was so crucial to early U2 tone. Just like all MXR pedals, this thing is a work horse, and its built to last. The only real problem that I see with it is that then controls for the Modulation (besides the on/off switch) are internal trim pots. That’s about it. Anyone other problem you might have wouldn’t be a flaw in the pedal, but just something that it wasn’t designed to do. Most guys seem to use it as compliment to their other delay pedal. If their digital or tape delay is set for ambience, then the CC is set for simple repeats. If their digital delay is set up for crisp rhythmic repeats then the CC is set up as a warm analog lead booster. It seems to be used to fill in the gaps. You don’t often see it as the only delay on a worship player’s board, but that’s not a knock on the pedal so much as it speaks to the delay pedal needs of the modern worship guitarist. That’s a good question. At the price point ($150) you’d save a lot of space on your pedalboard with the CC as opposed to a similar analog delay like the Way Huge Aqua Puss, but you’ll have less control at the same space than the Malekko Ekko 616. Not to mention that you’ll have no where near the options that you would with a digital delay like the TC Flashback. At the end of the day, if you’re looking for one delay pedal to meet all your needs I would look elsewhere. If you’re looking for a affordable, workhorse delay to cover the analog part of the specturm, or to be a sonic counter point to your digital delay then you could do a lot worse than the MXR Carbon Copy. I agree with you: MXR makes some great pedals. I have a Dynacomp that I really like. I once had a MXR eq pedal that was blue and had a heavy duty AC power chord built in- no batteries. I loved that pedal. It was stolen and my tone wasn’t the same without it. I do have a question: have you used delay on an acoustic guitar? Would the same pedals geared towards an electric guitar work with an acoustic or would a delay Taylor’s for the acoustic like the one Fishman makes be a better choice? great question. I would say most pedals except gain pedals (distortion, fuzz, od, etc) will work with an acoustic guitar. The question is whether you would want to or whether they’ll actually make it sound better. I’m with you on MXR. My Dyna Comp is always on and the Carbon Copy is crucial to my clean tone. And for some reason it seems that no matter where I set it, it always sits tight in the song – no tap tempo needed. That pedal and my Neunaber WET will remain on my board forever.